A smokey sensibility, by way of Lee Hazelwood and Jimmy Webb. Bobbie Gentry as done by the Zombies. Psychedelia. Jim Price of Neblung Price has been a dj at WFMU 91.1 FM for many years...and a damned good one. He began there in 1976 and was an early champion of R. Stevie Moore, with whom he has collaborated with since 1978. Price played an electic, free form stew of fiercely original stuff, from cheesy psychedelia to noisecore; in both cases, this electicism had a positive impact on his own music. Strictly a studio band, Neblung Price (Jim and his partner, Rick Neblung) build their recordings painstakingly track by track. The result is an inspired chameleonism. It's not so much genre-hopping (like Shonen Knife) or mimicry (like Todd Rundgren or Ween); it's more like someone poured a whole lotta good stuff together and then filtered it through their own offbeat, wry sensibility. It helps that the lyrics aren't jokey or imitative; they're Imagist concrete: "I see a wall of pictures/penny eyed and free/a hundred thousand shovels/can't bring her back to me." And unlike so many hipster bands, Neblung Price ain't afraid to belt or lean into a well-crafted harmony, bless 'em. One of Darker's songs is pure motorik; another sounds like Bobbie Gentry as done by the Zombies; another could be Carl Perkins and Jerry Lee Lewis duetting in someone's rec room. On the whole, though, Darker is less aggressively eclectic than their '98 debut, The Savage Songs of Neblung Price; there's folky sensibility here that's partial to pretty melodies played on acoustic guitars...or maybe it's a smokey sensibility, by way of Lee Hazelwood and Jimmy Webb. At any rate, it rawks, so get off yer duffs & buy dis platter. CHRONOGRAM MAGAZINE Review of Neblung Price "Darker"
The second album from Roxbury duo Jim Price and Rick Neblung. Recorded on an 8-track Tascam reel-to-reel recorder, Darker is loopy, eccentric and altogether wonderful. Songs like "Big Rudy (And His Happy Boys) are happy, Ween-like ditties that leave you wishing only for a George and Ringo to thicken Jim and Rick's stew. Others, like "Boneyard", justify the album's title with lines like, "A hundred thousand shovels/Can't bring her back to me." 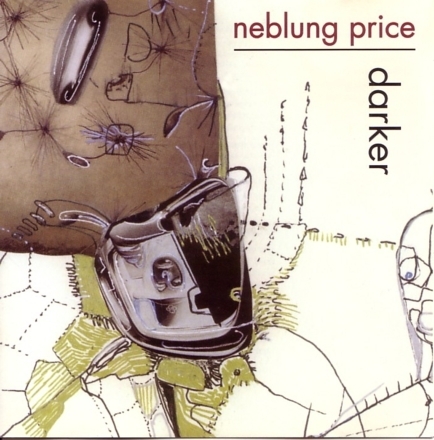 Price and Neblung seem to have mastered the moody instrumental, as well. Albums like this just remind me of how many really talented, really overlooked musicians there are in the world. Price and Neblung wrote all the songs and played all the instruments, and they can be proud of the result.